A spur of the moment, last-minute decision, and a little luck in obtaining a table on a Saturday night, landed six of us at the Fayette Street Grill in Conshohocken for an 8:30 reservation. My wife, Kathy, and I, along with Joe B. and his wife, Carol joined our friends JoAnn and Gerry who drove from their home in Oaks, PA, at this bustling BYOB in Philly’s western suburbs. We all arrived early and, since we had been blessed with another 72 degree day of warmth and sunshine on the first day of Spring, strolled through the town which is home to several good BYOB’s including Blackfish. Once inside the tiny bistro we quickly acclimated ourselves to the noise level which approached that of last night’s Bonefish Grill. Our charming waitress, Kim, recited the evening’s specials and reminded us this was another of those “3 courses for a certain price” places. 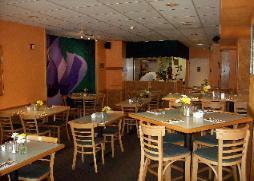 At Fayette Street Grill those three courses are a starter, and entree and a dessert, priced at $34.00. As our wines were opened I was anxious to try my very first bottle of a Stefania wine. F Scott and Zelda, over on the NJ Foodies blog, are huge fans of these wines and I had just purchased from an online seller, six bottles of the 2006 Stefania, Eaglepoint Ranch, Syrah. I am also awaiting a case of other Stefania wines which I am splitting with Gerry B. and John G.
In addition to the Stefania Syrah we also had the 2005 Shirvington Shiraz, McLaren Vale, Australia, the 2006 Luigi Bosca, Single Vineyard, Malbec, Argentina, and the always reliable, regardless of the vintage, 2004 Whitehall Lane, Cabernet Sauvignon. Our server delivered some additional wine glasses and we studied the menu as we taste tested all of our wines. I really liked the Stefania as it revealed itself with time in the glass. Nice, subtle flavors as the winemaker seems intent on letting the beauty of the grapes shine through without a lot of interference. Kathy thought it was too simple, Gerry and Joe thought it had a lot of complexity. The Shirvington was at the other end of the spectrum, big, bold, in your face, blackberries and dark mocha with that intensity found in Aussie wines. We all agreed it was a great wine for drinking on its own but no match for most foods. 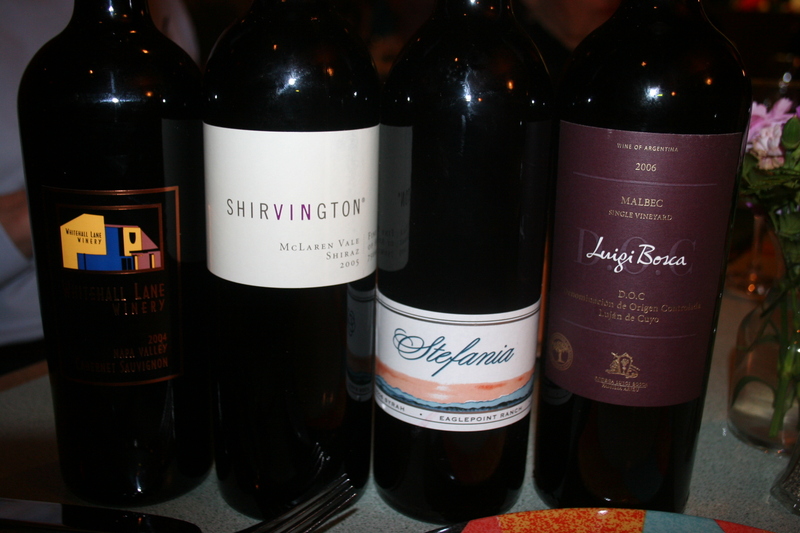 The Louigi Bosca Malbec was reviewed in-depth on the Blackbird post when Val brought it that night. Joe really likes Malbec and I had suggested he might like this one. He agreed, as we all did, that this was an excellent example of what good Malbec can be. Everyone enjoyed the reliable Whitehall Lane Cab. I think it was Kathy’s favorite. 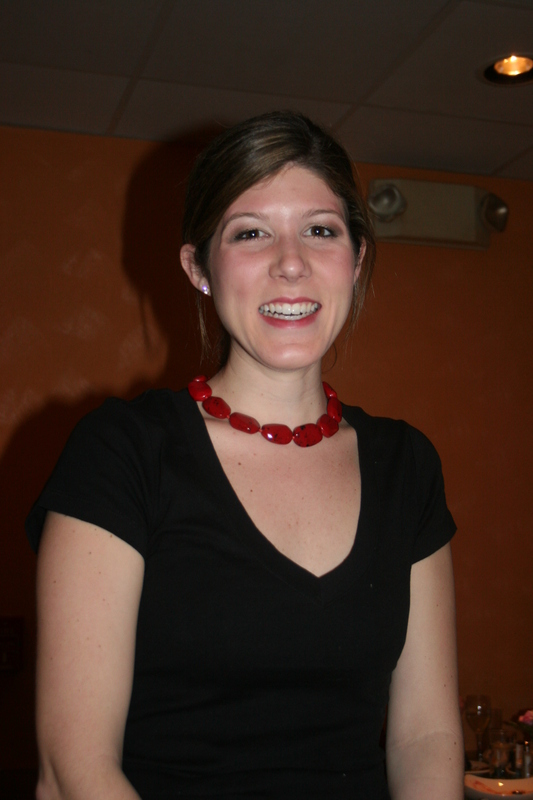 As nine o’clock approached the restaurant began to empty a little and conversation became easier. 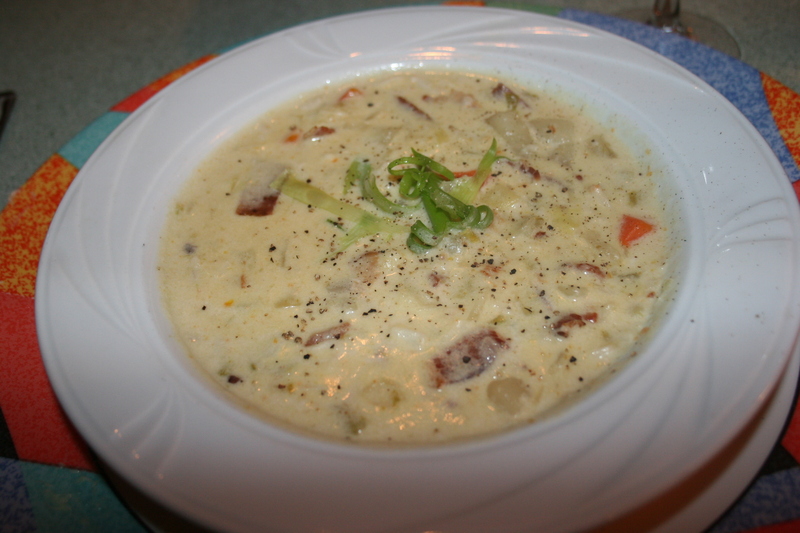 We all ordered our starters and Joe and I chose the Crab Chowder. It was OUTSTANDING. The creamy broth was nothing short of perfect and filled with lots of crab and some potato and other good stuff that made this an incredible offering. Joe was in total agreement; this was something special. 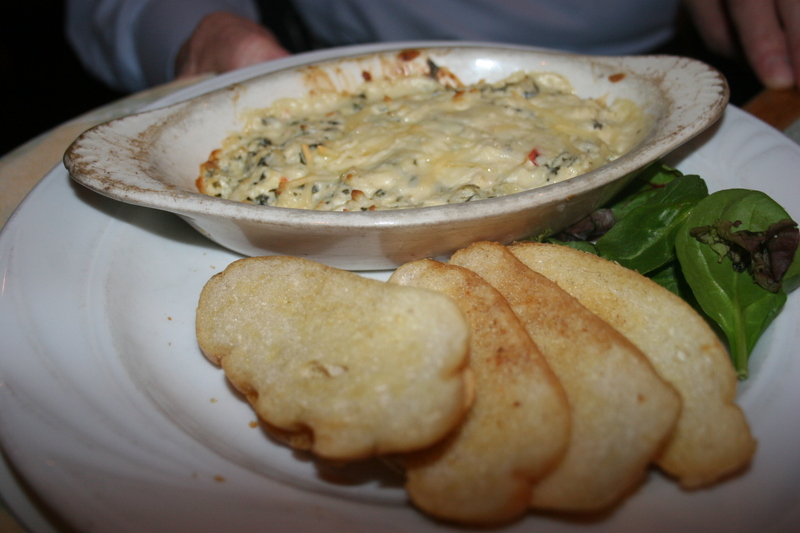 Joann had the Baked Crab Dip with spinach, peppers and old bay served with crisp rusks. 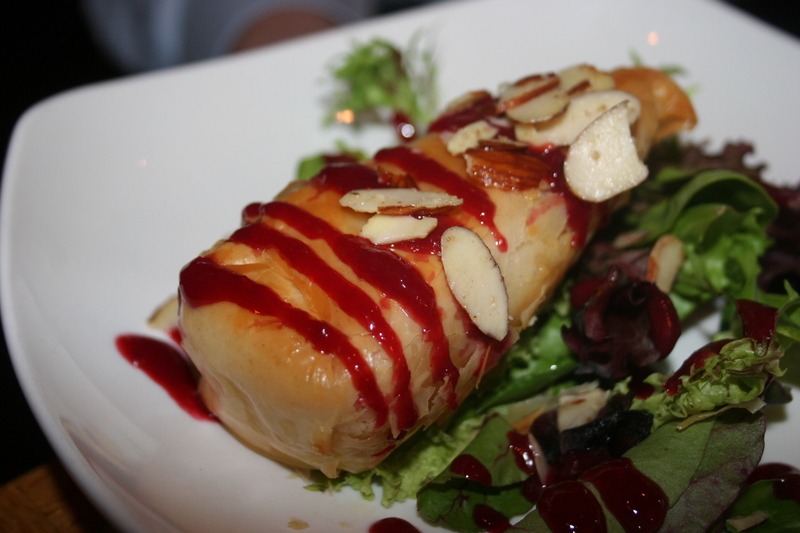 Carol had the Phyllo wrapped Baked Brie over field greens with raspberry sauce and toasted almonds. 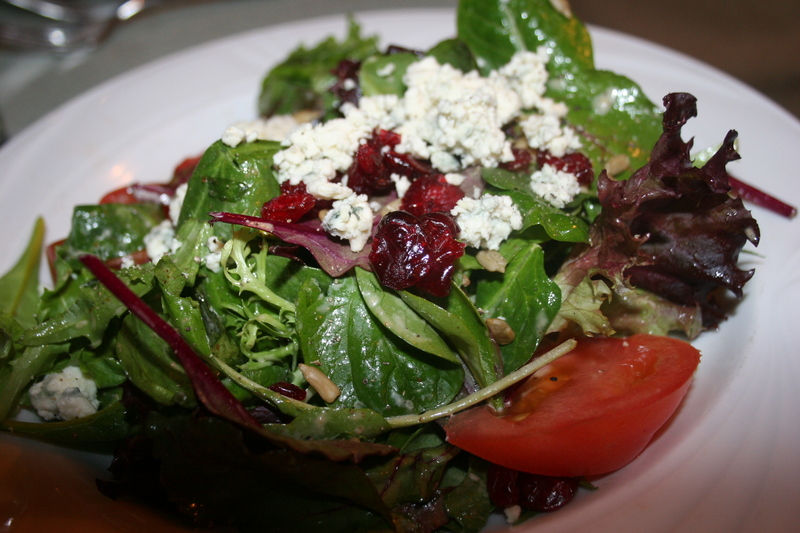 Kathy had the Mixed Field Greens with dried cranberries, blue cheese, toasted sunflower seeds and balsamic dijon vinaigrette. Gerry had the clams which were one of the evening specials. 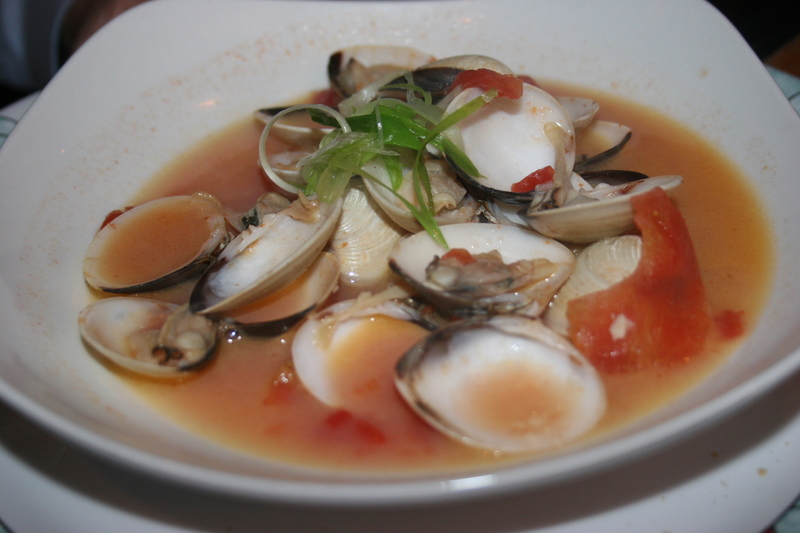 I am not a fan of clams or mussels but I thought his choice looked great and the sauce looked inviting . It appeared that he thoroughly enjoyed them. There were several items on the entree portion of the menu that drew my eye but, in the end, I chose the chicken. Several of the fish items sounded great but, after a night of fish on the day prior, I was craving meat. 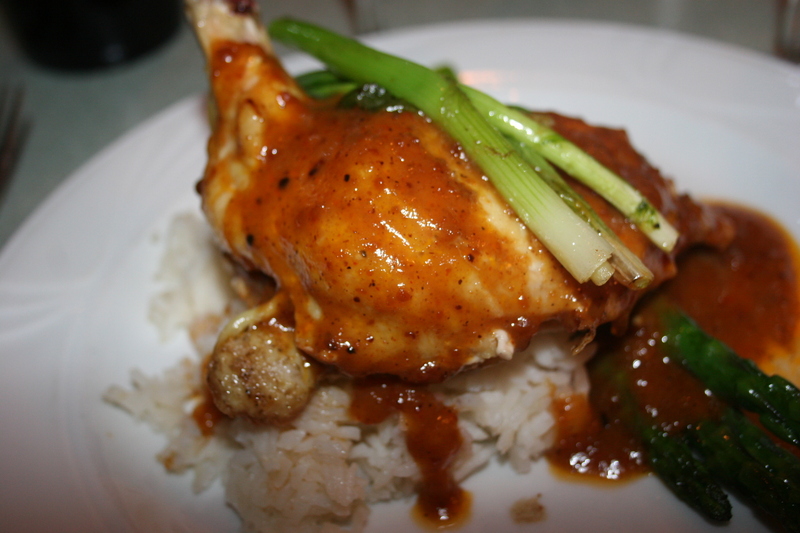 Kathy, Carol and I all had the Grilled Supreme of Chicken with a Thai Peanut Glaze, Grilled Scallions, Roasted Asparagus and Steamed Basmati Rice. I thought the chicken was tasty and loved the Thai glaze as it mixed with the rice. Personally, there is something about the bone-in chicken that disturbs me and takes away from the total enjoyment. Carol felt the same way. 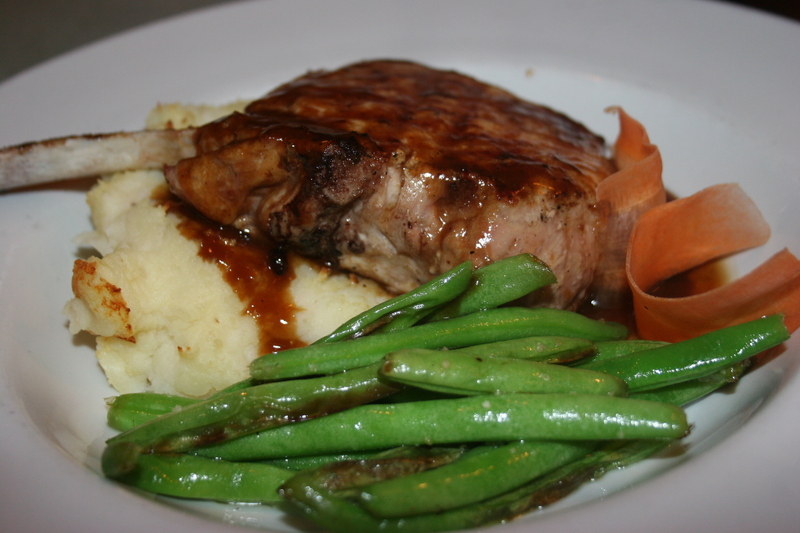 Joe selected my second choice, the Root Beer Glazed Center Cut Pork Chop, with Sauteed Green Beans and Warm Potato Salad. I had a little piece and found the pork very good but was slightly disappointed in the sauce as perhaps I was expecting a mouthful of Hires Root Beer while this was just the most subtle of hints of root beer. Good thing I am not a chef, I’d kill the taste of anything I cooked with my sauces. Jerry has never met a shrimp dish he hasn’t liked so it was easy for him to make his selection. 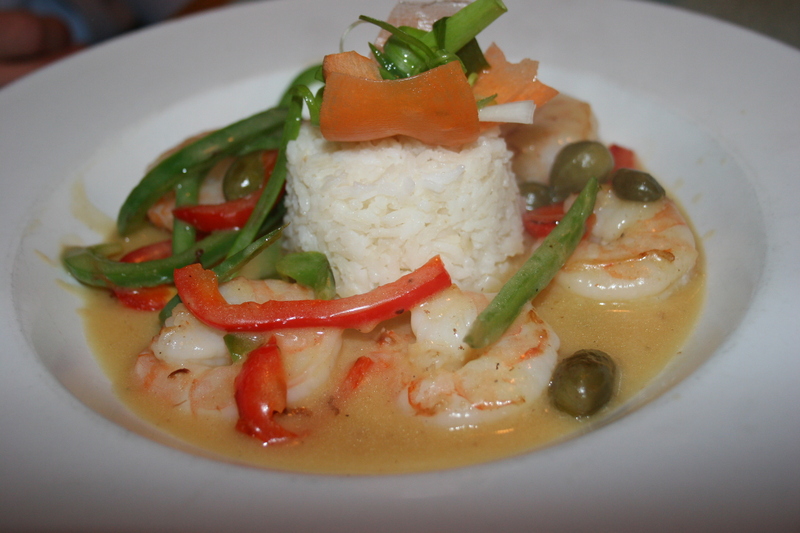 He chose the Sauteed Gulf Shrimp with Julienne Bell Peppers, Caper Berries and Lemon Butter Sauce with Basmati Rice. He seemed to totally enjoy the dish and it certainly looked appealing. 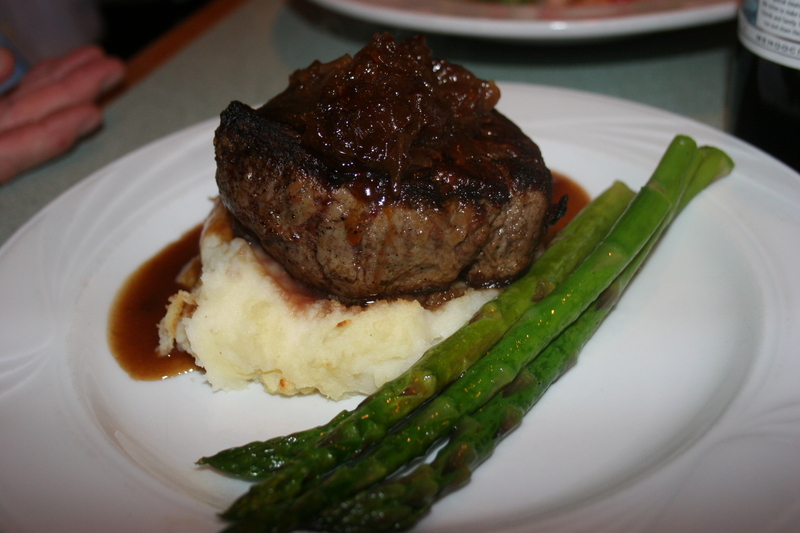 Joann chose the Pan Seared Filet Mignon served over Garlic Roasted Mashed Potato, with Red Onion Jam and Bordelaise Sauce. She gave Jerry a small portion of her filet, I guess because she believes that man can not live on shrimp alone, but she really liked the larger portion that she saved for herself. The wines were all tasting good, the conversation providing lots of laughter, and we topped off our meal with some outstanding desserts. 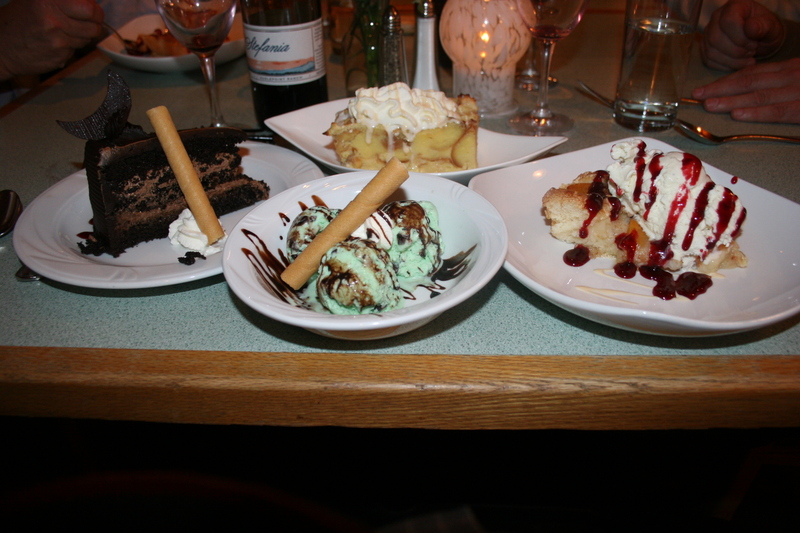 Although each of the items above probably deserves its own picture but what you see pictured above, going clockwise, is the Vanilla Infused Creme Brulee Bread Pudding, the Peach Cobbler with Vanilla Ice Cream and Raspberry Sauce, Mint Chocolate Chip Ice Cream with Chocolate Drizzle and The Dark Side of the Moon Chocolate Cake. I didn’t hear anyone at the table complaining about their choice and I know my Mint Chocolate Chip Ice Cream was the perfect ending to a very good meal. 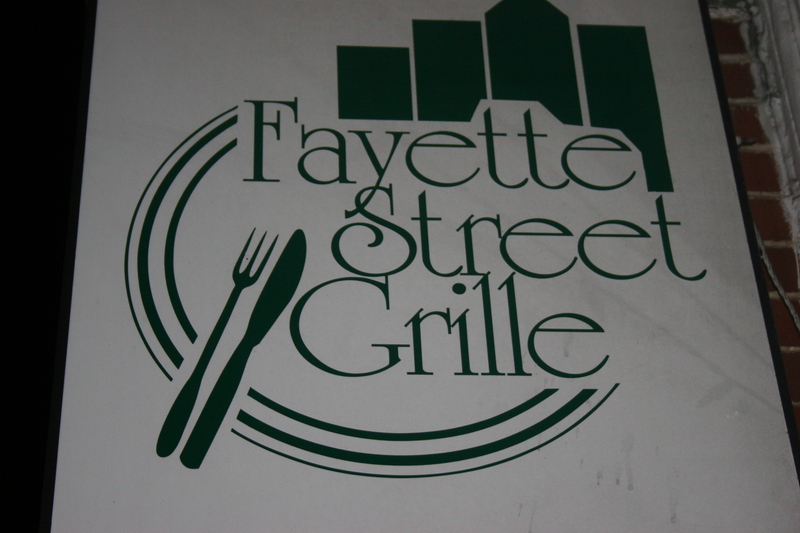 Fayette Street Grill only seats about 40 diners so reservations on a weekend are a must. It’s an excellent BYOB in an area with quite a few good BYOB’s and you should give it a try. I don’t think you’ll be disappointed.